A seven-building development with a grocery store on the ground floor is planned at the former Cascade Linen Supply Co. factory on Myrtle and Marcy avenues. BEDFORD-STUYVESANT — A new grocery store is planned for the ground floor of a seven-building development at the site of a former century-old linen supplier and factory. 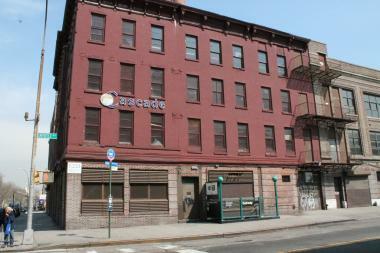 The owners at Cascade 553 LLC are looking to bring a supermarket to the new project, which spans from Myrtle and Marcy avenues to Stockton Street in Bedford-Stuyvesant, according to their attorney. The proposed 20,000-square-foot store will house space for produce, 6,145 square feet for perishable food and nearly 9,000 square feet for other food items, plans show. The grocery would make it possible for the developer, Isaac Deutsch, to have up to 20,000 square feet of additional residential space through a city incentive, the owners’ legal representative, Stefanie Marazzi, said at a community board meeting this week. The city’s Food Retail Expansion to Support Health Program, or FRESH, is part of an initiative bringing fresh-food options to underserved communities, in exchange for zoning incentives. In addition to the supermarket, hundreds of apartments are set to rise to replace the former Cascade Linen factory, where demolition has already begun. The project includes three six-story buildings, one eight-story mixed commercial and residential building, a nine-story mixed-use building and two 10-story mixed commercial and residential structures, Marazzi said. A total of 301 apartments will be available, with 66 expected to be affordable housing, Marazzi added. The site will also have 118 parking spaces. Brooklyn Community Board 3 raised concerns about contaminants on the site since the property is slated for environmental cleanup. Land at the lots were found to have contaminated soil, soil vapor and groundwater, according to the New York Department of Environmental Conservation. The state is supervising the cleanup. The community board does not have final say over the project as it is a private development, but held the public hearing for questions and comments from residents. Locals took issue with the number of affordable units and jobs for residents, saying more should be provided for the community. The supermarket’s construction is pending approval from the Department of City Planning.